Synergy Ultimate Balance is a gluten-free, soy-free, dairy-free, fructose-free, non-GMO source of pure plant proteins. One serving of this instant protein beverage mix provides 18 grams of high-quality proteins from legume (pea protein) and rice protein. The unique complex of pea and rice protein, has a well-balanced amino acid profile including a high content of lysine, arginine, and branched chain amino acids. Synergy Ultimate Balance was designed to reinforce healthy habits. Built on three core principles of daily nutrition, it makes a balanced meal replacement. 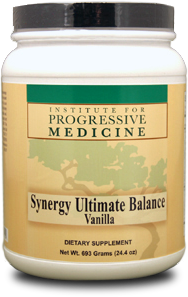 Click here to go to Synergy Ultimate Balance in our online store.